Hi! Thank you so much for sharing your search. I'm going to have to move to a place with cleaner air, since the NC ozone is causing chronic sinus pain. Your blog is so helpful! Would it hurt to make me a Canadian? 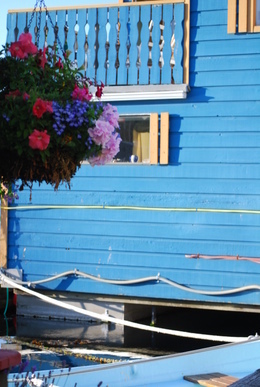 Scared of heights, especially when driving in a forecasted snow flurry on a steep incline above crashing waves, I called Ford Trucks about my drive to Tofino next week. Yes, I plan to leave sunny Southern California for a snow flurry and crashing Pacific Ocean waves. On the threshold of spring, it's questionable whether I'll soak in the full charm of Tofino's legendary gale force winds that in concert with the ocean display massive waves in front of throngs of yellow-rain slickers, otherwise known as wet tourists, but its possible. And for sure snow flurries are forecast hence the call to Ford Trucks in Victoria. 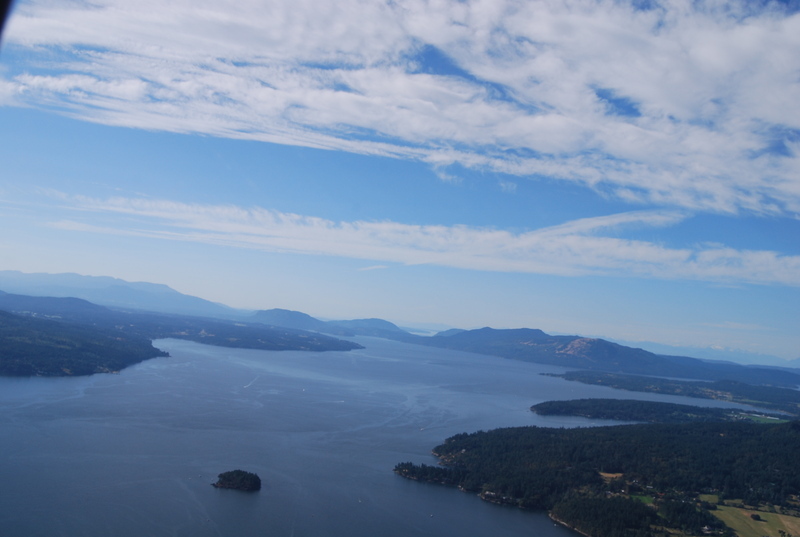 It may not sound like a clean air idea to you--calling Ford that is, but Ford makes hybrid SUVs and my vision of the Tofino drive includes preservation of my body parts. So I called to inquire about Ford's trucks, 4-wheel drives and their tread, words barely in my Southern California sunny vocabulary but I needed to get an education on how to drive in snow and rain while on a cliff road while curbing anxiety. I suppose a glass of wine... No. Yesterday you could have found me at the Travel and Adventure Show at the Los Angeles Convention Center. You wouldn't have known that we were in a recession. Many people looked like they were making travel plans. Every corner of the world was represented and rather than go into overwhelm, I stuck to the Caribbean and South Pacific areas with an emphasis on New Zealand. But wouldn't you know it, what I remembered most was overhearing a few Caribbean travel representatives discussing the air quality within the Los Angeles and Long Beach Convention Centers. They said that the Los Angeles Convention Center "won" for better air quality because, according to these seasoned convention-goers, the ceilings are higher so bad air has more room to circulate. Side note: Last time I went to Faster Freight Cleaner Air (FFCA) at Long Beach Convention Center, where clean air leaders came from around the world to discuss air quality solutions, I noted doors from the garage to the convention area were open, fumes coming in. My breathing felt negatively impacted and I had to leave early as a result. Too bad for those who enjoy breathing clean air that this year, FFCA will again be in Long Beach. Maybe they'll close those garage doors. For information about the FFCA March convention, click here. The Caribbean travel representatives said the best convention center in Southern California is San Diego because they're not over a garage. Tomorrow, I'll take the B.C. Ferry from Victoria to Vancouver. 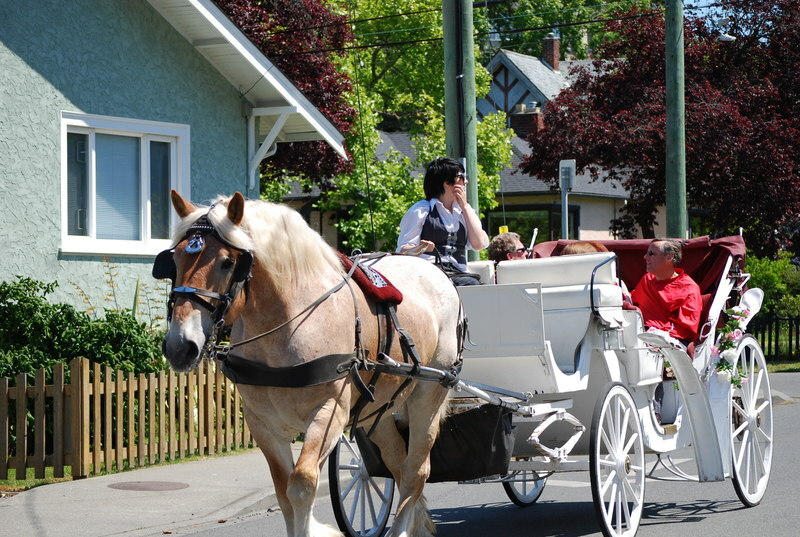 As excited as I am to explore Vancouver and beyond, I don't feel quite ready yet. I was just thinking about how much better I feel most days here compared to other places, especially L.A.. I think because this is an island, and not so easy to get to, the population and industry remain low. The most important thing is air goes down easy except for one day when pollen count was probably high and so were the winds. 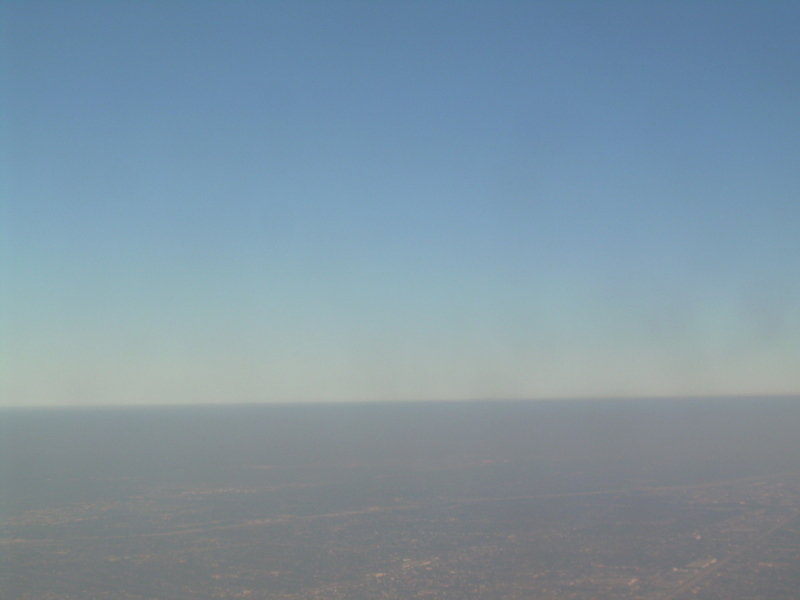 As you can imagine, in Los Angeles air frequently doesn't go down easy. 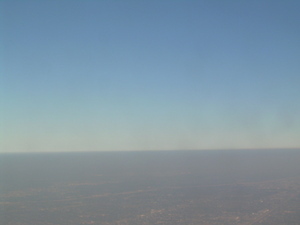 Scientists say breathing L.A. air is like smoking 1 to 2 packs of cigarettes a day. Looks like smoking all day to me. How many packs would that be? Photo of a typical summer day from the air, which I took flying in last summer. Even when you wake up feeling good (though I never woke up breathing as well as here) if pollutants get trapped in the basin later in the day, and I go out to exercise, I feel discomfort in my lungs and head whereas in Victoria I just go about my day and don't notice either. In L.A. friends talk about their breathing, coughing, and congestion the way people in Victoria talk about going to coffee or getting an ice cream. They eat a lot of ice cream in the summer. And a lot of women jog on Dallas Road on the weekends. Oxymoron? An unexpected positive here, moist air = moist skin. My fingernails and feet are in much better shape--no dryness--than back in the desert of Southern California. So okay they charge four times as much for manicures and pedicures, but you don't need them as often. You can drink water from the faucet here. You can in Los Angeles, too. But with toxic dump sites seeping nearby in any given area, would you want to? 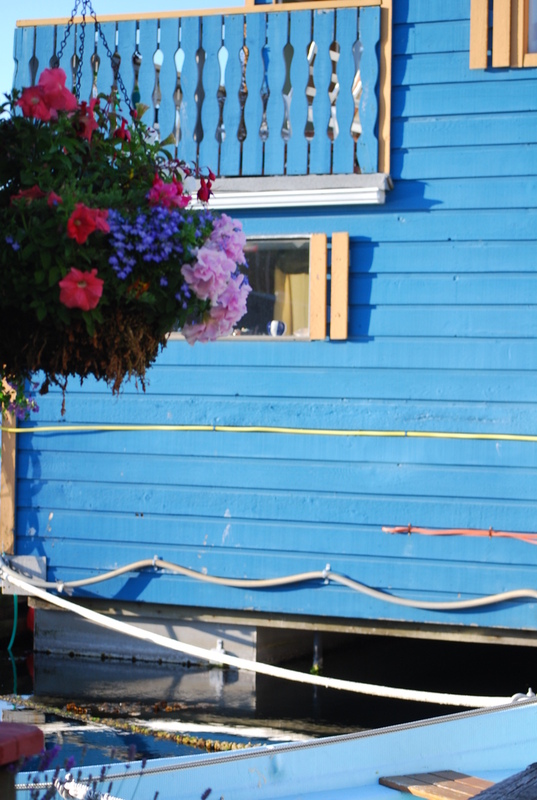 One of the true joys of Victoria, and everywhere I traveled on Vancouver Island is the space. Space not to be crowded out. You can hear yourself think without reacting to the guy next to you, two-inches away with honking cars in the background. A symphony of cell phone talkers and cars merging into white noise, with the occasional baritone who must be heard reciting last night's game. 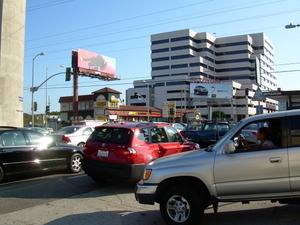 And then there's the occasional crash of cars, as the result of frustrated deal-makers in the fast lane getting nowhere. And the sound of a car back-firing? Don't be so sure. In L.A. a favorite pasttime is one upping your opponent on how to drive to a destination the easiest and quickest way, invariably on clogged roadways and freeways, which is just silly when you realize what you really need is to morph into a Jetson's spacemobile. I'm debating to leave one of my two suitcases (I'm not a gifted packer) in Victoria, which means I'd likely return in near future. I could mail a suitcase back to L.A. but I'm not interested in picking up my things there, though eventually I will get my belongings, which include a Yamaha U-3 piano, grandma's china from Romania, and an assortment of attractive shoes. So I'll sign off for today to enjoy sunny Victoria, feeling satisfaction that my efforts for the time being have paid off. 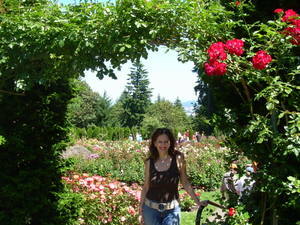 Portland is known as the city of roses, and green is everywhere: An emerald jewel that's easy to walk. Carlton and I made our approach to Portland with the excitement of two adventurers on a clean air mission. And with the trepidation of one who'd been lied to about conditions in Troutdale, surely, I surmised everything could only be uphill. 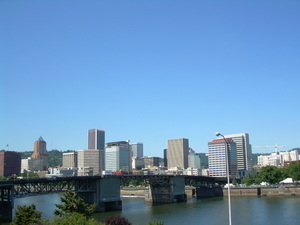 Portland appeared as a pretty skyline on the Willamette River. I captured this postcard moment from our giant gray Chrysler cruising into town. The buildings were smaller but no less impressive than major U.S. cities, and the backdrop was trees. My first impression of Portland was it's pretty but a city. It has a river where cargo ships spew diesel as they pass through. The air went down easy, nonetheless, and the sky was clear blue. Of all my chasing clean air destinations, Portland is the most livable city. Other choices are, naturally, smaller towns and islands, islands where claustrophobia, hopefully, isn't an issue. Could I live in a city again? Could I really leave a city? We found a parking lot near Powell's Bookstore in downtown Portland, and squeezed through its entrance. Carlton--being no coward--maneuvered our giant gray whale of a car with aplomb. Steering, while pausing to check the right, left, and rear-view mirrors to ensure we wouldn't hit people or cars, he twisted and contorted his head, neck, and body, and made our whale fit between a small Saturn, with Obama for President stickers, and a red scooter, without one scratch. Carlton's perspiration was palpable. He removed one layer of clothing, and then another. And unencumbered, he morphed back into a Southern Gentleman, sauntering over to a money box where he paid the $9.00 a day city parking fee. And we were ready to begin our walking tour of Portland at the world's largest bookstore. Birkenstocks, and unusual looking flat sandals seemed to be on every stooped over old lady, hide-in-go-seek playing kid, and not-so-fashionable looking woman and man. I wore red and white ASICS running shoes that I bought at Frontrunners in L.A., made in China, which, means, this purchase contributed to air pollution not to mention our big car that Thrifty said was the only they had to offer. Feet! Feet! So very many toes, exposed. Maybe it's my Los Angeles influence coupled with my San Francisco upbringing, hammered by my New York work stints (co-ghostwrote a book) that made me more aware of feet attire than books. Feet attire reflects an overall package, creates a mood, which in Portland, is au natural. In a good way, just different than what I'd grown accustomed to. Wandering the aisles, and looking at hesitating, striding, and pausing feet in front of stacks of books got me some attention. 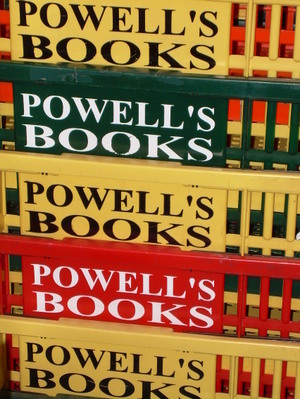 As I was about to photograph an older woman's left sandal to capture the mood of Powell's Books, (it was an unusual brown sandal with lots of straps), she shot me a glare. That's right. And before I knew it, a white male with a thick stomach hanging over a frayed brown belt and wearing smudged silver wire-rim glasses, told me there were no such photos allowed in Powell's Books without permission. He looked at me as though I were strange. So I diverted my eyes from a sea of sandals and looked up to find myself drowning in fiction books. Yes, there I stood in the middle of a raging fiction section, facing my music again. Why didn't my fiction book make it when their's did? Why did my agent give up after 16 rejections when writer friend's agents didn't give up until a book deal? And why is my self-talk like a twelve year old? Grow up! Down another flight of stairs. "Carlton!" Under a canopy of books, I found Carlton absorbed in a history book. It lay open flat in his hands, like, sure, he fit into the scene. He looked the college professor he was. I tugged at his sleeve. "Carlton, can we go now?" 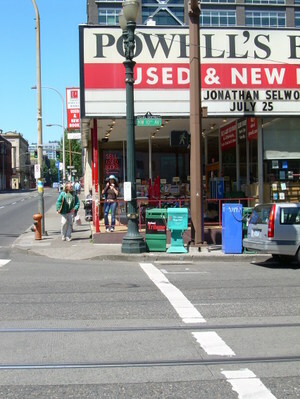 As we exited Powell's Books to walk Portland streets, I saw a woman wearing high-heeled shoes. She stood out like a fashionable New Yorker might at a grassroots Save the Whales convention. She looked like someone who could be my friend. I didn't dare take her photo in the sea of Birkenstocks, but I wanted to. Los Angeles Traffic -- at night? So to avoid traffic, I did errands last night at 9:30 p.m. 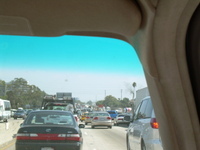 I was stuck in bumper-to-bumper traffic on the 405 South at 9:30. The night sky was illuminated by the lights of city, cars, and the hope that traffic will end. When I was in Seattle, Friday night rush hour, around 6 p.m., was 20-25 miles per hour. That was a dream compared to Los Angeles. New York City, they're lucky spoiled with that fabulous subway system. Washington, DC, they zip on fancy Metro. And more construction projects are on the way for our overpriced, over-rated in many ways, Westside of Los Angeles. No subway here. Subway shops, yes. Sit in your car and wait for a parking place, please. Freeway construction, a new Waldorf Astoria at corner of Wilshire and Santa Monica--what a bottleneck nightmare that will be--new condos going up in Century City, and regular renovations to our numerous potholes. 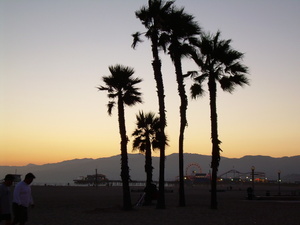 Yet the sunsets are beautiful, the beach a dream, and did I tell you the weather forecast is a sunny, 78 degrees today? Tip: It's best to pump gas at night so fumes aren't as toxic from sun's heat, assuming you have sun that is.